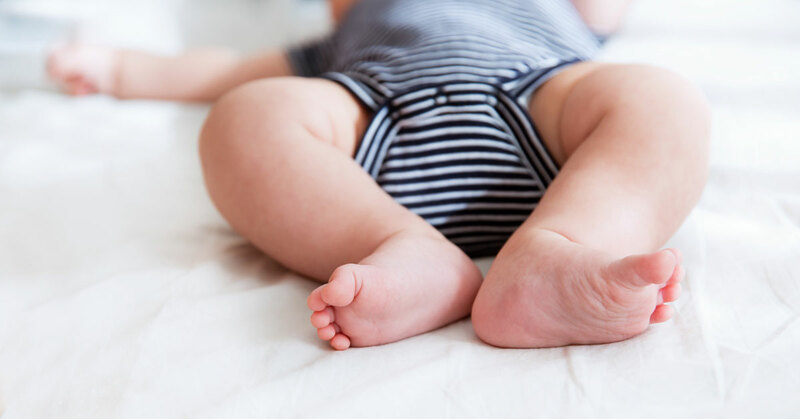 Can't figure out which bassinet is right for your baby? Check out our review of the best bassinets. Where will your baby sleep once he comes home from the hospital? This is one of the important decisions you will make as new parents. 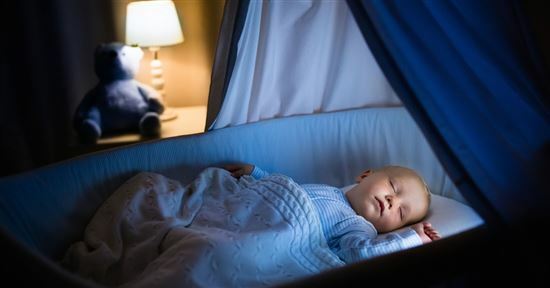 You need to decide if you will co-sleep, use a bassinet, or go right to the full-size crib. Many new parents choose a bassinet because it is smaller and cozier. Some bassinets are even portable. This means you can take them from room to room or even out of the house. Most babies outgrow the bassinet by the time they are 4 or 5 months old, though. This means you should consider the cost amongst other factors when choosing the right bassinet. Who Really Needs a Bassinet? First, let’s start with who needs to use a bassinet. Some people avoid this purchase because of its short life. While you do not use it for very long, it does provide a comforting place for your baby to sleep. It also has many benefits for new parents, especially new mothers. Moms recovering from childbirth benefit from a bassinet placed right next to the bed. It helps to limit the number of times they must get out of bed. In addition, a bassinet in the room often gives parents peace of mind knowing their baby is okay. This can lead to a better night’s sleep. There are many factors to consider when looking for the right bassinet. The obvious factors include the mobility and design. You should also consider the uses, safety, and storage requirements. Again, because this might be a short-term investment, you should give careful thought to how you will use it. Uses: Bassinets come in many different styles, and your exact needs will help determine the right one. For example, some bassinets swivel. This makes it easier for a mom overcoming a C-section to get to the baby with limited movements. Other bassinets safely attach to your bed. This is a good option for parents who wish to co-sleep. 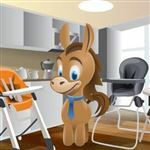 Mobility: How easy it is to move the bassinet is another important factor. If you need to use the bassinet outside of your home, you want one you can easily fold up and pack in your trunk. If your bassinet is for home use, consider the type of wheels on the bassinet as well its weight. Versatility: Some bassinets even grow with your baby. Its use changes, but you get more life out of your investment. For example, several pack 'n plays have removable bassinets. Once your baby outgrows the bassinet, you can use the pack 'n play to keep him secure while napping or playing. Size: Bassinets come in many different shapes and sizes. Knowing where you plan to use it will help you determine the right size. If you have a small space, choose a more compact product. If you do not have limited space, you can focus on features rather than the space it consumes. Safety: Bassinets do not have strict safety guidelines like cribs. This could pose a danger to your baby. Several companies still follow the ATSM guidelines, though. You can also look for the Juvenile Products Manufacturers Association seal of approval. Design: How the bassinet fits into your decor is also important. If baby prints don’t fit into your modern décor, look for clean lines and solid patterns. This allows the bassinet to blend in with your home. Storage: Because you only use the bassinet for a few months, storage is a strong concern. Take a close look at how it folds up to see if you have enough room to store it. This is especially important if you plan to have more kids in the future. The typical bassinet is for newborns, but some offer more features than others. 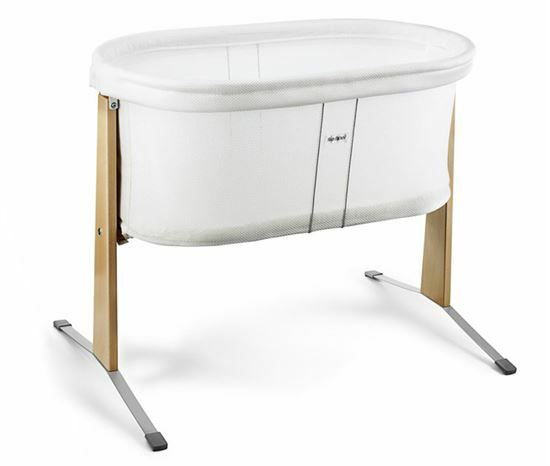 The Kolcraft Cuddle 'N Care Bassinet is a perfect example. You can use this product as a typical bassinet or as an incline sleeper. Many babies need an incline for a stuffy nose or for chronic colic. It is suitable for newborns between 3 and 15 pounds. We love the versatility of this bassinet, as it is one of the most functional bassinets available. If you like to prepare ahead of time, you should consider this bassinet. We love the included incline sleeper, helping babies get more comfortable. We also love the vibration and soothing music to calm a fussy baby. The bassinet turns into a rocker if you keep it stationary in one room, too. However, if you need to move it, the wheels easily lock for your baby's safety. We also love the attached light on the bassinet. You won’t have to search for a missing pacifier in the dark! 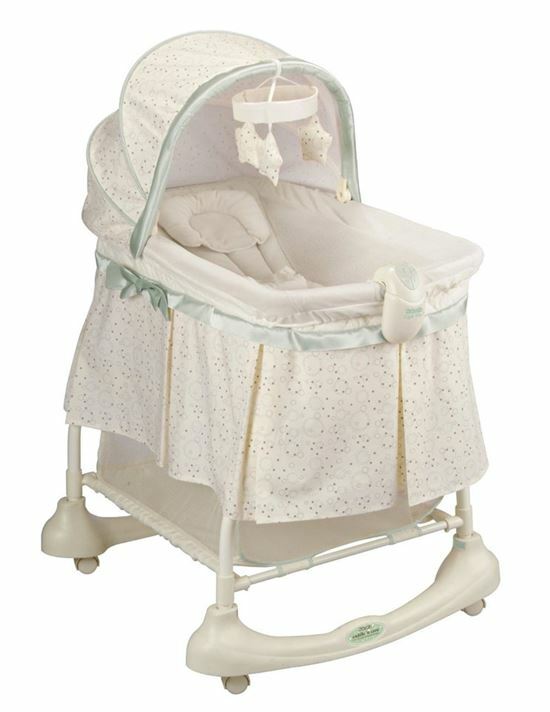 We also appreciate the simple design of this bassinet with so many features. It blends well with almost any décor and the material is very breathable for your baby. One downside we noticed about the Kolcraft Cuddle 'N Care is the lack of portability. This bassinet does not fold up compact enough for travel. It is also not height adjustable. If you don't have an average size bed, the bassinet might not reach your mattress height. It can also pose a problem for taller parents to reach their baby. Lastly, the bassinet does not grow with your baby, which makes it an expensive investment. This bassinet is a great choice for new parents who plan to spend their baby's first few months at home. If you have a baby with congestion, colic, or acid reflux, this is a great choice for you as well. The bassinet meets the JPMC guidelines. This means your baby will be safe and comfortable in this bassinet. This is a great product as long as the height meets your requirements and it will remain at home. It is also gender neutral and functional, giving you a great return on your investment. Baby gear can take up a lot of room, especially in small spaces. The BabyBjorn Cradle offers plenty of functions, but with a small footprint. As an added bonus, it contains a very simple, clean design, making it easy to fit it into any décor. Safety is always of utmost concern, which is why we love the simplicity of this baby bassinet. There are no areas where a baby can become trapped or injured. The product and the materials also meet American safety standards. This helps to decrease your baby's risk of a reaction to the materials. We also appreciate the cradle's low weight of 13 pounds. This makes it easy to transport around the house. The sturdy foot grips give it a safe grip on the floor too. We also love the breathable material on this bassinet. Your baby can stay cool with the mesh sides. They also make it easy for parents to check on the baby without disruption. We also love the rocking motion on this bassinet. It helps to lull a baby to sleep, which can make middle-of-the-night wakeup calls easier to handle. If your baby likes close quarters, this bassinet might be too large for him. It has a wide-open space, which some babies do not like. The tighter the space, the more it mimics the feeling of the mother's womb. Of course, if you purchase the product before your baby is born, this is a hard determination to make. There is no mattress replacement available for this bassinet. We saw this as a disadvantage, as the bassinet becomes more expensive. If you need to change the mattress in the future, you would have to purchase a new bassinet. This is a disadvantage for parents who plan to have more kids in the future. If you want a safe place for your baby to sleep throughout your home, this is a great choice. With its simplistic design, the bassinet can mesh with any décor and it takes up little space. If your baby is okay in large spaces, this bassinet has many benefits. It is safe to use from newborn through 18 pounds, unless your baby hoists himself up sooner. Having twins means double the blessings; it also means double the baby gear. Trying to figure out where to fit everything can seem like an overwhelming nightmare. You don’t have to forgo the convenience of a bassinet just because you have two babies and limited room, though. The Graco Pack 'n Play with Twins Bassinet gives you the best of both worlds. It provides a safe place for two sleeping babies along with use for the future. This gives you more bang for your buck. We love the ability to have both babies in the same area without overwhelming a home. Two bassinets in one room can be too much even for parents with a large home. That’s why we love this Pack 'n Play with two roomy areas for your newborns to sleep. We also adore the canopies on this bassinet. They shield your babies from sunlight or even bright lights in the house. This means peaceful sleep no matter which room you place them in. We also love the versatility of this product. You can use the bassinet function until your babies weigh 15 pounds each. Afterwards, you can use the play yard until your children weigh 30 pounds. This gives you a safe place for your older babies to play. Most babies love to have a secure area to play with their toys). Because this play yard has breathable, see-through fabric, it keeps babies calm and comfortable. One drawback we found with this product is the lack of portability. Typically, you think of the pack 'n play as a portable place for your baby to rest or play. You can move this pack 'n play, but it is large. It also does fold flat, but it weighs 29 pounds. This can be too much to make it a portable product. Another issue we discovered is that the sheet that accompanies this product is not waterproof. With babies, especially twins, you have to worry about them soiling the bed. The pack 'n play could be rather difficult to get clean if a baby soils it. You may need to purchase a waterproof product separately to keep the bassinet clean. Parents of twin babies who need a safe place to keep napping twins will benefit from this Graco product. 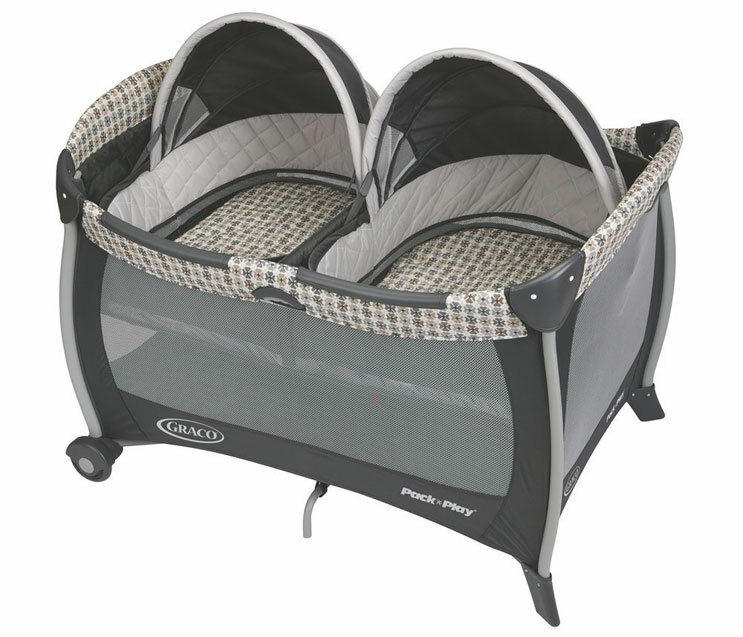 The twin bassinets make it easy for babies to sleep together. This is something most twins prefer right from the start. With two bassinets in one place, this product takes up less room in any size home. It is a good choice for parents who need a stationary product, as it is not something you would move often. Families on the go often need a comfortable place for their baby to rest. The car seat, which fits into the stroller, is not always comfortable or even safe for small babies. The Britax B-Ready Stroller Bassinet solves this problem! This bassinet attaches to the Britax B-Ready Stroller. The bassinet also easily removes from the stroller. This gives you multiple uses. You can even let your sleeping baby remain in the bassinet after a long walk rather than disturbing him. The bassinet part of the stroller is good until your baby reaches 20 pounds. The LulyBoo Lounge to Go Infant Bed is a 1-pound bassinet. This gives parents who travel a simple way to have a portable bed for their baby. It even carries like a backpack, freeing your arms for your baby. The top of the bassinet has a canopy to protect your baby's eyes. It also has a toy bar to keep him entertained while awake. Because this bassinet has soft sides, you should not use it as a co-sleeper, though. Parents who choose to co-sleep with their baby need a safe place for them to sleep. The Arm’s Reach Mini Arc Convertible Co-Sleeper provides this safe place. The fourth side on this co-sleeper drops down, making it possible to have your baby right next to your bed. You can also lift the fourth side, securing your baby in the bassinet when you need to step away. Many parents get better rest knowing their baby is right there within arm's reach. The ability to swiftly move a bassinet is a great benefit. The HALO Bassinet Swivel Sweeper not only easily moves, but it swivels 360 degrees. This makes it easy to pull your baby towards your bed or out of the way when you get up. With easy swiveling, new moms can reach their baby without too much stretching. The bassinet itself takes up only 32” and the base can even fit underneath the bed to double as a co-sleeper. There are many reasonably priced bassinets available. Take your time and do your research to find the right one for you. 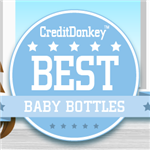 Share on Facebook "Best Bassinets"